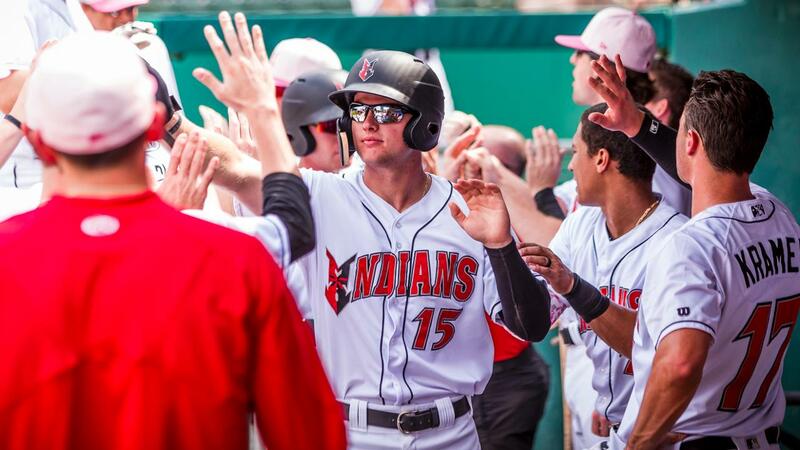 INDIANAPOLIS - Indy's largest comeback win of the season came on Mother's Day, when the Tribe rallied from 7-2 down by scoring 10 unanswered runs en route to a 12-7 victory. The Indians totaled 19 hits and all nine batters had at least one knock - seven of them posting multi-hit performances. The Tribe gained early control with two runs in the first inning. Kevin Newman roped a leadoff single, his first of three leadoff hits in the game, and later scored on an Austin Meadows double into the right-field corner. Kevin Kramer then plated Meadows with a soft liner to left-center. The visitors bounced back against Indians right-hander Austin Coley. Mike Papi cashed in a Yu Chang double that opened the second with a two-bagger of his own to make it 2-1. One inning later, Melky Cabrera tied the game with an RBI double before sprinting home on a Chang single. Three straight Clippers reached safely with two outs in that frame to give them a 3-2 advantage. Their momentum continued into the fourth as Coley couldn't prevent further damage. A one-out walk to Papi and infield single to third by Richie Shaffer preceded a hit batter that set up an Adam Rosales grand slam to right-center. The salami placed Indy in a 7-2 hole. The Indians settled for one run in the home half on a Pablo Reyes RBI single, but left runners at first and third after having them there with no outs. Then in the fifth, Eric Wood doubled with two down and hustled home on an Erich Weiss grounder to first that was misplayed. The deficit was three at 7-4. Indy finally got back over the hump in the sixth, scoring five runs off Cole Sulser and Jack Leathersich. Newman singled and stole second, took third on a Christopher Bostick base hit and scored on a Meadows single. Jordan Luplow then made it a one-run ballgame with an RBI single. Wood provided the big blow with a three-run homer off Leathersich that put Indy in front for good. The offense didn't slow its roll until the finish line. Newman doubled to start the seventh and scored on a Meadows groundout. Bostick also scored on another defensive miscue by Columbus. Indy's 12th and final tally came in the eighth thanks to a Bostick two-out single. The unsung hero of the game was Indianapolis' bullpen foursome of Casey Sadler, Bo Schultz, Josh Smoker and Dovydas Neverauskas. They combined to throw 5.0 scoreless innings, scattering two hits while striking out seven.